A great way to spice up your chicken breasts is stuff them with delicious options! This recipe uses both spinach and tomatoes to spice up an already healthy dish. In a medium bowl mix together the cream cheese, spinach, cherry tomatoes, Parmesan, basil, oregano, garlic and salt and pepper. Cut a long horizontal slit through the thickest side of the chicken breast, nearly to the other side, to create a pocket for the filling, being careful to cut all the way through. Season each side of the chicken breast with salt and pepper. Fill each pocket with half of the cream cheese mixture. Use toothpicks, if necessary, to hold the pocket closed. Preheat the Indoor|Outdoor grill on Setting 4. 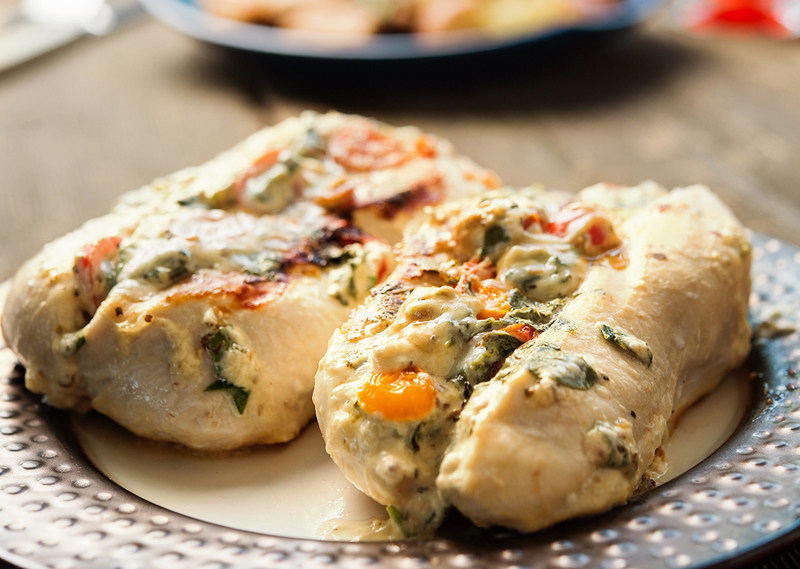 Place the stuffed chicken breasts on the preheated grill. Place the lid on the grill. Grill the chicken breasts for 14 minutes on one side. Carefully flip the chicken and continue grilling, with the lid on, for 12 more minutes. Let the chicken rest for 5 minutes before serving.